Postcards for Progress Team is taking a break right now and will be back in the fall of 2019. The human connection. The personal touch. These are our most effective tools to inform in the face of apathy, to reach the otherwise occupied and to motivate both friends and strangers to act. But we can establish the human connection in ways other than the stressful cold call, or ringing a stranger’s doorbell; ways that are both effective and dare I say it, fun! I know: Let’s have a party! A postcard party. And here’s the thing: Hand written messages really work. ​It’s the human touch. Perhaps because we are so accustomed to communicating using a keypad, the impact of receiving a note that someone has taken the time to write by hand and perhaps even decorate, impresses us. The urgency of a cause or the virtue of a candidate is magnified several times over a television ad or even an email. Think about it – when is the last time someone took the time to write you a handwritten note or letter and how did it make you feel? 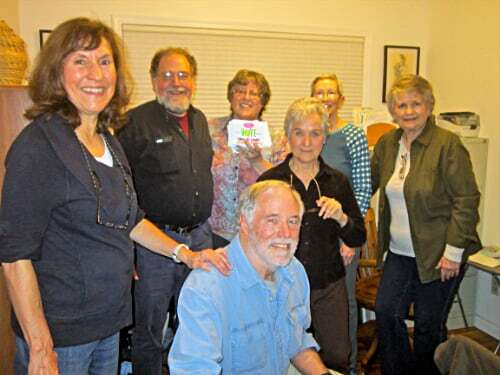 Since well before the 2018 election, we’ve been getting together regularly in groups of five or ten or even thirty at private homes (such as ours) or public spaces and written cards to get out the vote. We urge our legislators to act or thank them for doing so, educate voters and even officials on the importance of the issues on environment, health care and education. We ask people to remember universal human dignity in a nation and world where dehumanization of the “other” makes up daily “tweets” of so called leaders and the rants of TV and radio hosts. And it works. And it is fun. So join us! See old friends and make new ones. “Buddy up” to do other activities. Talk, exchange ideas on what and how to write. 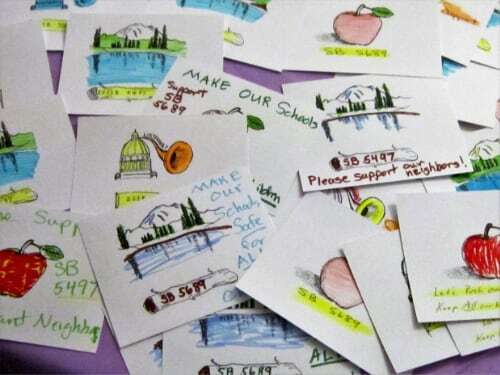 If you are artistically inclined, decorate the graphics on the printed postcards, have a snack -- and make a difference.